White fillings are a type of tooth restoration most commonly used to fill cavities, which are small holes in the teeth caused by dental decay. White fillings are made from material called composite resin and are very popular because they blend in perfectly with the colour of natural teeth in just one single visit. This ensures that you cannot distinguish the filling from the rest of the tooth. This is an effective treatment for making teeth stronger when they have been affected by decay. If a cavity is not filled the hole may get bigger and lead to an infection. The alternative to a white filling is a metal amalgam filling. This used to be a common treatment, but most people prefer to have white fillings now as they are much more aesthetically pleasing. Some people also have concerns about the safety of amalgam fillings. Initially, there was concern that white fillings may not be as strong as metal fillings, but modern materials are much stronger, durable and suitable for most teeth. The procedure to fill a tooth with a white filling is straightforward and should not cause any discomfort. The procedure will be carried out under local anaesthetic to ensure this. Before the cavity is filled it is cleaned out and any decayed tissue is removed. Filling material is then poured into the cavity and set hard using a light beam. We will then trim the filling to make sure it fits the cavity and your bite perfectly. 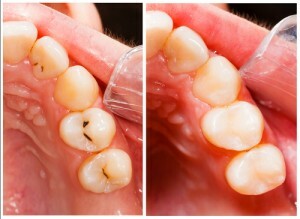 Fillings may also be used as part of the cusp capping process. This procedure is effective in restoring the structure of damaged teeth and in providing support for the application of fillings to other areas of the teeth. It can also be a quicker, less expensive alternative to crowns.